International swimming competitions feature four strokes: freestyle, butterfly, backstroke and breaststroke. The freestyle remains the fastest stroke, according to world records posted on USAswimming.com, followed by butterfly, backstroke and breaststroke, the slowest competitive swimming stroke. The classic freestyle, also known as the front crawl, combines a scissor kick with an overhead arm pull in which the arms move in an alternating pattern. Swimmers face the bottom of the pool to swim the freestyle. The international swimming governing body, the Federation Internationale de Natation or FINA, does not provide specific rules for the execution of the freestyle in its rulebook. In fact, swimmers can swim in any style they choose during freestyle events, except in medley events, when they may not swim backstroke, breaststroke or butterfly. Still, most swimmers perform the classic freestyle stroke that has proved to be the fastest stroke in competitive swimming. 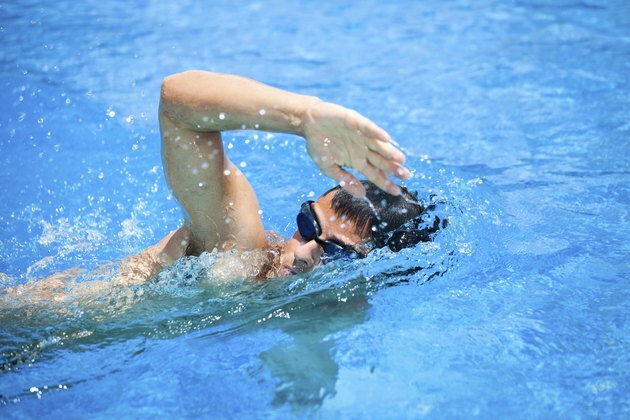 The butterfly stroke combines a dolphin kick with an overhead arm pull in which the arms move together. According to FINA rules, swimmers must move their legs up and down simultaneously and may not perform a scissor kick or butterfly kick. Butterfly swimmers also must move their arms together simultaneously throughout the race. All of the fastest 50 m, 100 m, 200 m, 400 m and 800 m swimming records have been achieved in freestyle events, according to the world records posted at USAswimming.org. Cesar Cielo of Brazil holds the world record in 50 m freestyle with a time of 20.91 seconds, achieved in December 2009. This time beats the fastest 50 m breaststroke time by 5.76 seconds, achieved by Cameron Van der Burgh in July 2009. Cielo also holds the world record in 100 m freestyle with a time of 46.91, achieved in July 2009. Paul Biedermann set a world record in the 200 m freestyle in July 2009 with a time of 1:42.00. Rafael Munoz set a world record in the 50 m butterfly in April 2009 with a time of 22.43, only 1.52 seconds slower than the fastest 50 m freestyle time. Michael Phelps holds the world records in the 100 m and 200 m butterfly, with times of 49:82 and 1:51.51, swum in August 2009 and July 2009, respectively.